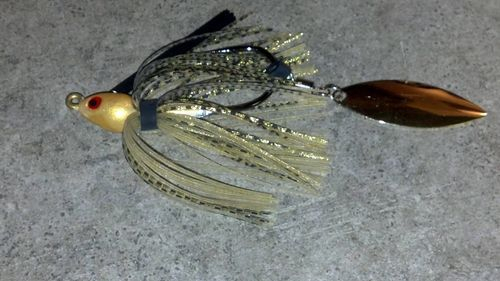 Our CTH "Gimmie Shimmy" Swim Jig is truly an exciting, yet simple lure concept that may often be overlooked by anglers. We took our proven Swim Jig design and made it bigger an better. Through on the water testing and tweaking, we found that by adding the #3 1/2 Gold, willow blade design to the back of a 3/8oz Swim Jig head, we could offer our customers a true "Hybrid" lure that fish cant resist! The "Gimmie Shimmy" Swim Jig offers anglers the flash of a spinnerbait and the profile of a jig, for those quality bites that we all are looking for. It is a reaction bait in the highest regards, and eliminates the decision making process when trying to determine which trailer to use on your Swim Jig. Simply slow roll it to get it lower in the water column or burn it with today's high speed reels in order to cover grass beds quickly & effectively. Either way, you can't go wrong!! Orders can be placed by email at [email protected] or by phone at (985) 688-2273.